Honora Wins the OSBRC Great Wolf Lodge Family Day Prize Draw! Home » News & Events » Honora Wins OSBRC Great Wolf Lodge Family Day Prize Draw! 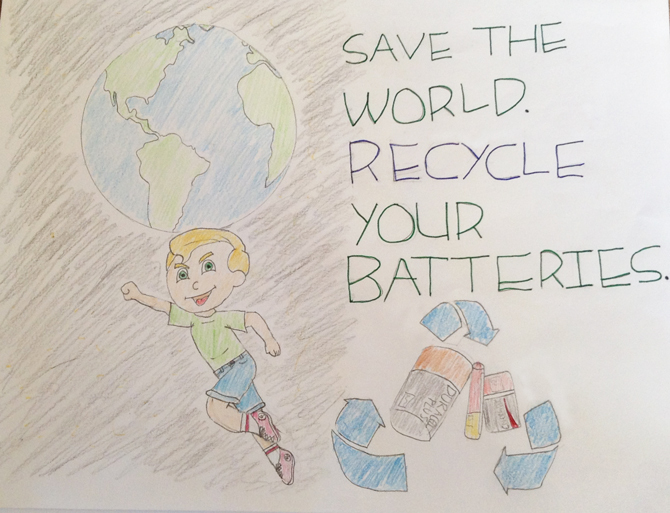 St. Cecilia is participating in the Ontario Schools Battery Recycling Challenge, a recycling competition between 125 elementary and secondary schools across the Province. As part of the Challenge, students can complete missions for a chance to win individual prizes. For the third time in as many years, Honora completed all five missions to become an official Battery Boss. Honora’s name was selected on Family Day and together with her classmates, she was presented with her prize at a school assembly earlier today. "We're so happy for Honora," said Sarah Lacharity of Raw Materials Company. "She's been engaged in this Challenge since it first started three years ago and it's just great to see her rewarded for her hard work and continued participation in the program." The Challenge is put on by Raw Materials Company, a battery recycling facility in Port Colborne. The purpose of the Challenge is to teach students and their families about the proper way to handle and store household batteries and why it’s important to recycle them when they no longer hold a charge. The Challenge started on the first day of Waste Reduction Week in October and finishes up on the Friday before Earth Day, April 21, 2017. At the end of the Challenge, the top three schools will receive a portion of a provincial prize pool with 10% reserved for a donation to the SickKids Foundation on behalf of all OSBRC participants. The OSBRC has grown significantly over the past three years and this year schools are on pace to recycle more than ever. With six weeks remaining in the Challenge, schools have already recycled more than 650,000 household batteries.